Ernesto Colnago was on hand in the hall of the prestigious Palazzo Todeschini Vinessa, Desenzano del Garda, on December 23rd to inaugurate the first edition of Colnago Cycling Festival Desenzano del Garda and Desenzano del Garda 2nd Gran Fondo Colnago. Joining Ernesto Colnago in kicking off the official work for the event were Mayor Rosa Leso (above with Ernesto Colnago) and Councillor for Sport Righetti. "First of all, I want to thank the mayor and the authorities, I have had a house here for so many years that I feel like a Desenzanese," said Colnago. "The last edition of the granfondo went very well. There is much interest from foreigners in this event. Desenzano is known for its lake, art and culture, and now I wish that it will be also known for cycling." The Colnago Cycling Festival will be a three day weekend of cycling in Desenzano del Garda on Lago di Garda, from 2 to 4 May, 2014. 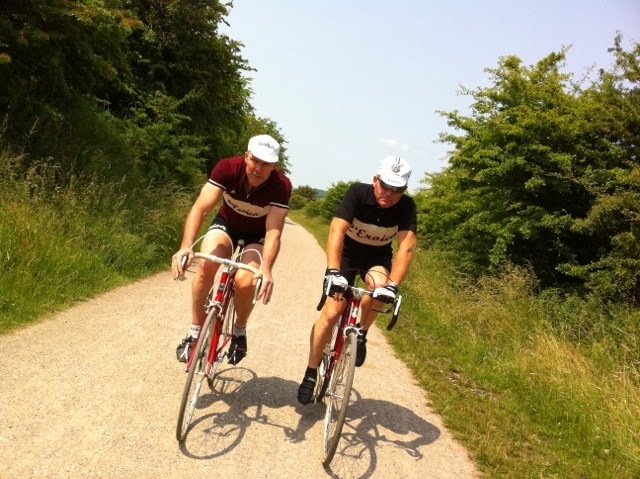 Events include the granfondo , the first Lake Garda Circuit Randonneur (200KM or 100 Km; ACP-Audax Club Parisien-regulations apply), and the "Garda Legends" event for vintage “eroica” bikes. Registration for the granfondo is open now at 30 € until December 31: from 1 January 2014 until 6 April, the price will be 35 € and 40 € from April 7 to 30 . 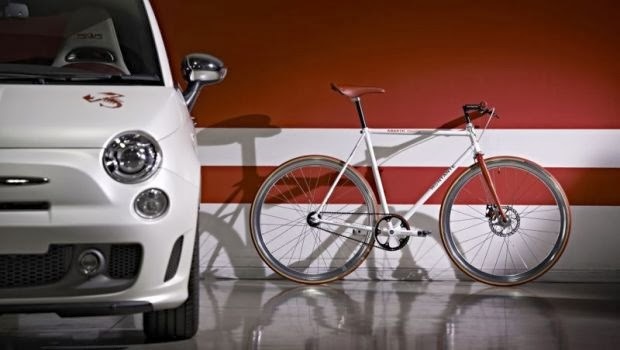 Cicli Montante is making a limited edition of 50 single speed bicycles, in collaboration with Abarth, to celebrate the 50th anniversary of the iconic, small super car, Abarth 595. The bicycle is pictured with the Fiat 500 Abarth 50th anniversary edition. Below, the Fiat 500 Abarth with a 1963 500 Abarth 595 (photo by www.caranddriver.com). 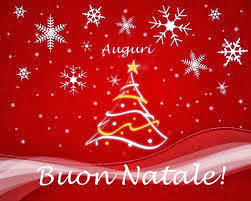 You can contact Cicli Montante, via www.montantecicli.it, for more details. FYI: In 2010, Montante had a collaboration with Maserati (photos here). 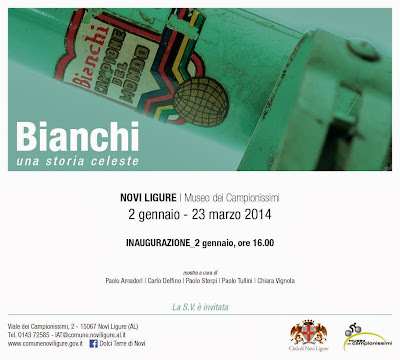 Should you find yourself in or near Novi Ligure between January 2, 2014 and March 23, 2014 be sure to visit the Museo di Campionissimi where a Bianchi exhibition is being held; inauguration January 2nd at 4:00pm. 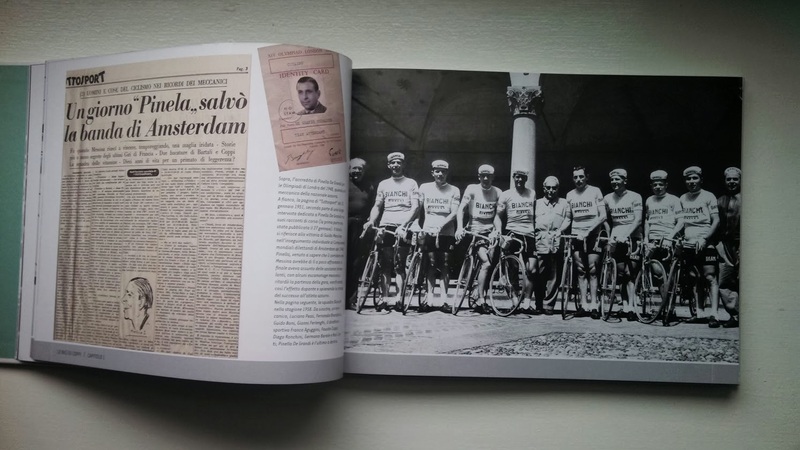 Among the curators of the exhibit are Paolo Amadori and Paolo Tullini, the authors of the recently released book "Le bici di Coppi" (The Bicycles of Coppi). 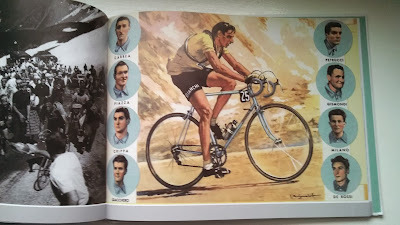 As a reminder, my latest list of cycling museums in Italy is here.Note that the Museo del Ciclismo is now closed until April. Part I (description of the new book, "Le bici di Coppi" by Paolo Amadori and Paolo Tullini). My thanks to Troy for the following photographs he took of the book to give us a sense of the contents. 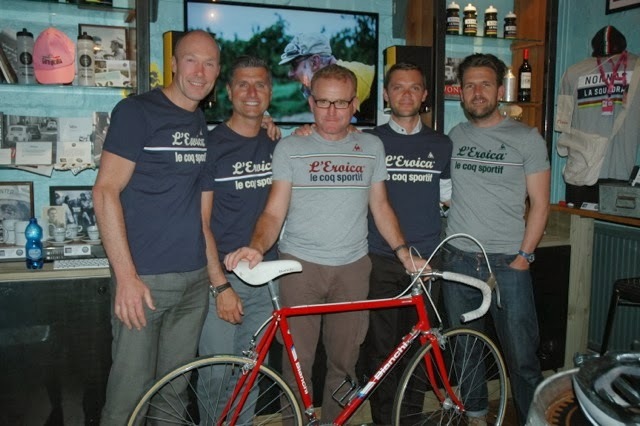 L'Eroica is coming to the UK. 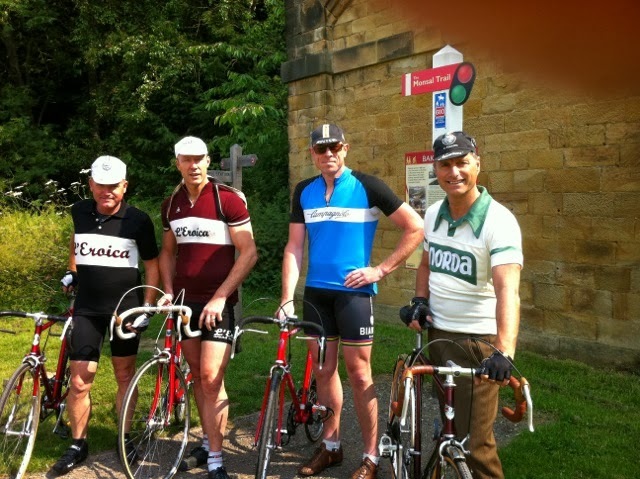 L'Eroica Britannia, the only approved licensee in the UK to use the L'Eroica name, will be held June 22, 2014, in the Peak District National Park. The official website is www.eroicabritannia.co.uk. Bakewell, the start/finish town, is located in the Peak District National Park, here is a short video featuring Bakewell. After a very successful season in 2013, the UCI World Cycling Tour (UWCT) enters 2014 with much exciting news and some very positive changes. While our classic European qualification venues such as Italy, Belgium, Spain, France and Austria continue to increase international participation numbers every year, our other non-traditional European venues such as Greece and Denmark have been busy leading the change in their cycling culture. Whereas South Africa, Australia, Brazil and the USA continue to establish their events as great celebrations of international cycling. Moving forward for 2014, two new events will appear on the calendar: Mexico City and Kuala Lumpur, Malaysia. Maraton Franja (Ljubljana, Slovenia) will be the venue of both a qualifier event and the UCI Amateur Road World Championships. As a greater number of riders take on preparations on par with that of the pros for their upcoming racing season, training camps in warmer countries are quickly becoming a very attractive addition to their programs. And for those who are looking for a bit more excitement in their camps, stage races are the answer. New in 2014, there are two early qualifier stage race events that can fit perfectly for this purpose. Perth is the first one with a time trial on Friday, a traditional lap road race on Saturday and a new Granfondo style race on Sunday. Crete is next, hosting a stage race with a time trial and two road races. Leader jerseys will be given to the leaders of the general classification. Riders will also have the opportunity to skip one race day. Another change is the combination of the two youngest age groups into one new 19-34 age group. The challenger class will cease to exist while all remaining age groups will continue to have the chance to compete for the official UCI Rainbow Jersey. 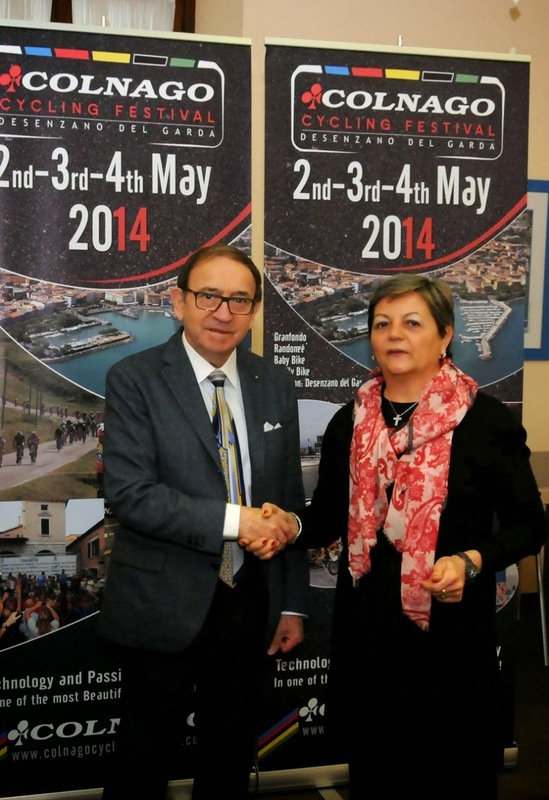 The UWCT Final has officially changed its name to UCI Amateur Road World Championships. This event will be held in Ljubljana, Slovenia from 28-31 August 2014. The younger age groups will compete on a 157km course while the older age groups will have 100km to cover. The 19km time trial is a real classic one; totally flat and windy. As in 2013, there will again be a team relay event in the program. In a partnership with renown Belgian sports marketing agency Golazo, the UCI has created the UWCT Corporation. This corporation will be responsible for the overall organization, coordination and marketing aspects of the UWCT qualifier events. Ride, dine and wine with Italian cycling royalty. Thomson Bike Tours has announced the 2nd edition of a truly extraordinary cycling event. 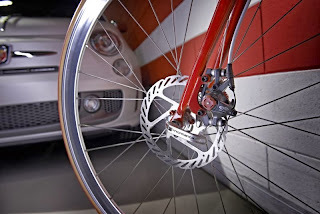 The Campagnolo Experience: October 11th-18th, 2014. Get an inside look at the iconic brand who's history, craftsmanship and passion have shaped the face of cycling as we know it. 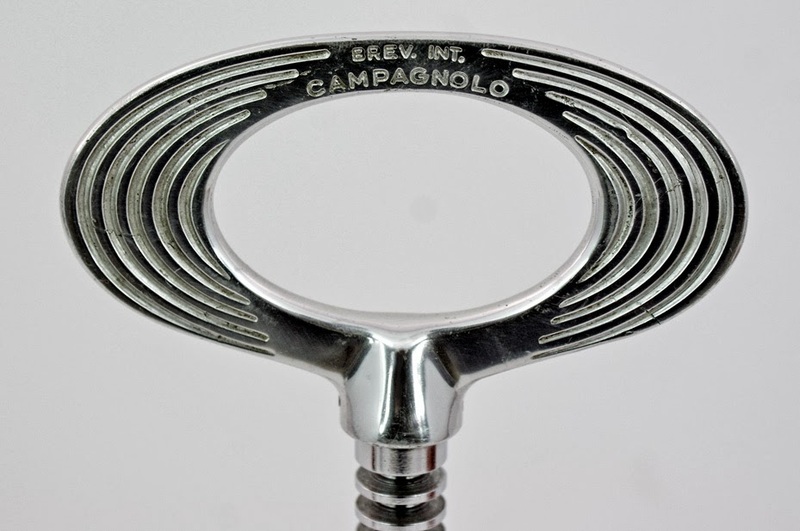 Kick-off the week as special guests at the world renowned Gran Fondo Campagnolo Roma. Spend the week riding historic and spectacular Italian routes. Finish with the ultimate privilege: a private tour of the Campagnolo Headquarters in Vicenza, followed by a dinner and tasting at Astoria, the official Prosecco of the Giro d'Italia. Advance Reservations for the 2014 Campagnolo Experience are open now, space is limited! Details here. 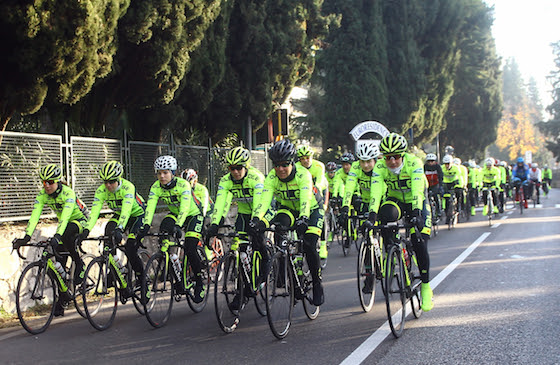 The women's professional team ALÉ-Cipollini-Galassia has decided to use Peschiera del Garda, on Lake Garda, as its first training camp to prepare for the 2014 season. The camp is 10 days in length with time divided between cycling, swimming and the gym. Sun, a microclimate, good roads, the scenic lake with charming town dotting its shores and a strong cycling culture make it a perfect location. On Sunday 200 fans rode behind the team (above). Why does Lake Garda have a Mediterranean microclimate? Lake Garda was formed by a huge glacier coming down from the Alps 1.5 million years ago. So why is Lake Garda so fertile? Well, the as the glacier moved through the valley, it ground up loose magnesium-rich limestone into a paste, which placed itself along the sides of the ice. When the glacier melted, the moraine resulted in the rich fertile soil found along the shores of Lake Garda enabling things like lemon trees, orange trees, olive trees and many exotic flowers to grow. July is the hottest month of the year at the average of 29 degrees! The temperature is the coldest in January at the average of 6 degrees, but it never gets very cold because: in the summer when it's really hot the lake warms up. Through the cold months it keeps its heat, and the heat floats up and warms the air. Also the mountains above it keep it sheltered from wind. 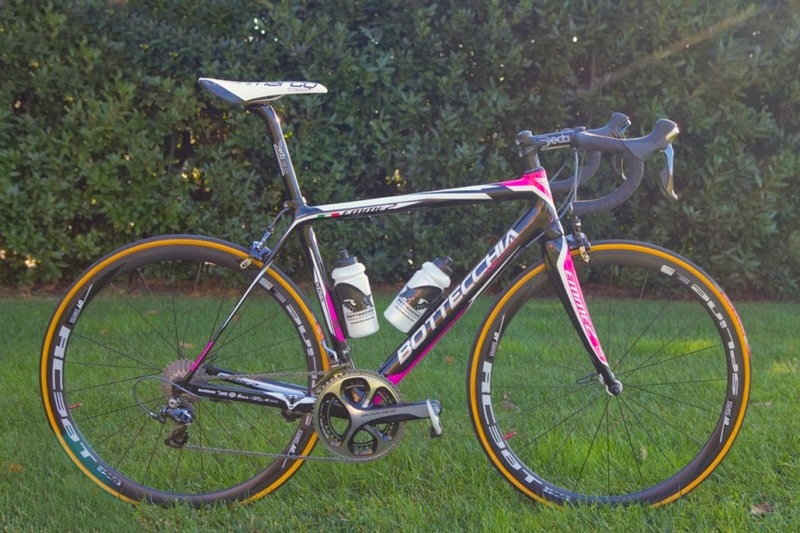 Team Lampre-Merida is preparing for the early season races of Tour Down Under and Tour de San Luis. 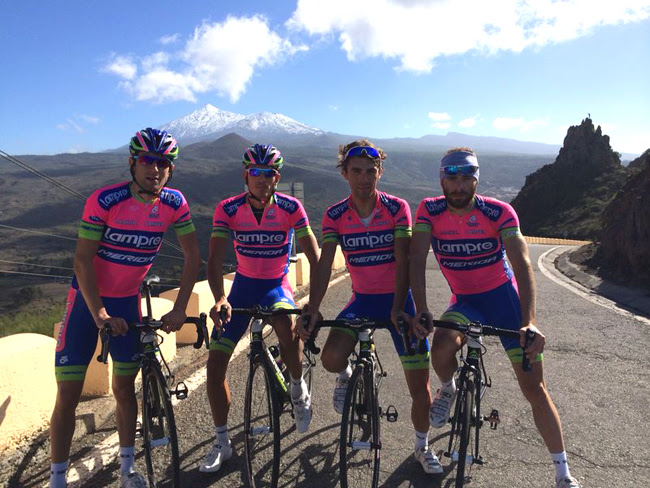 Ulissi, Wackermann, Mori and Bono (above) are in Los Cristianos, Tenerife, Canary Islands, enjoying beautiful weather and great roads. "The temperature is really good, more or less 23°, and the courses are perfect for our aims," Ulissi explained. "I'm sure these sessions of trainings will be very useful in order to improve our fitness". 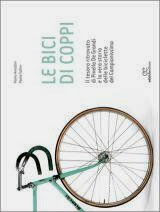 A new book has been published entitled "Le bici di Coppi" by Paolo Amadori and Paolo Tullini. 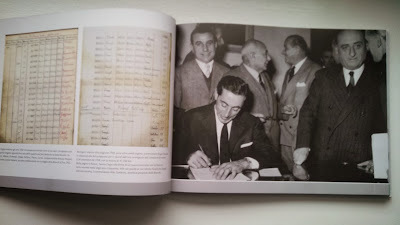 The book is written in Italian but the photos are what most people will be interested in. The book is close to 200 pages and there are multiple photos on most pages. 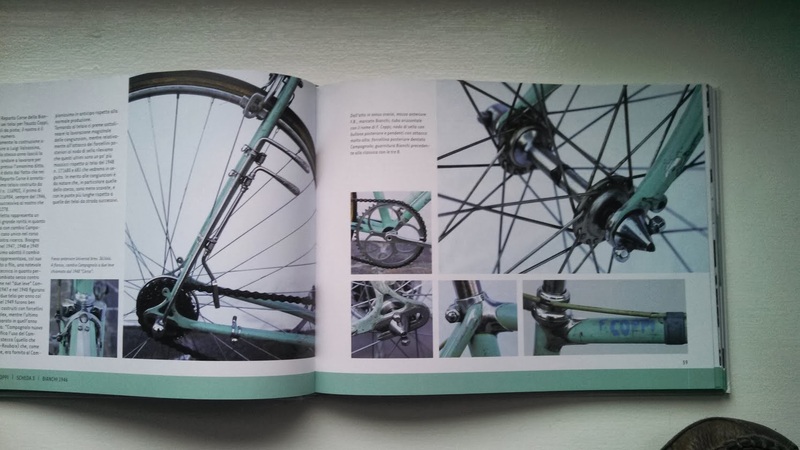 The story of a finding that will shake up the world of bicycle-related collecting. 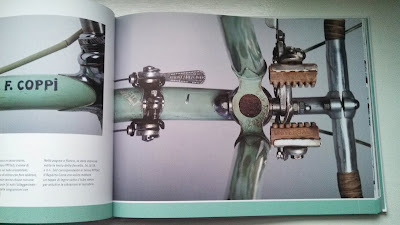 The faithful reconstruction, based upon historical documentation, of the Bianchi bicycles used by Fausto Coppi over the course of his extraordinary career. A book that is not to be missed by all lovers of memorabilia and vintage bikes. 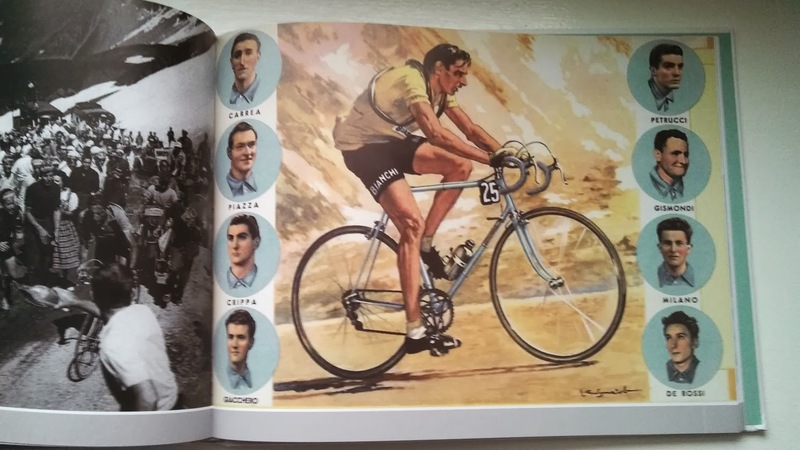 Much has been written about Fausto Coppi, both as a racer and as a man, about his exploits, about his death and about the construction of a true and proper myth. On the other hand, little has been said about the relationship between the Campionissimo and his bikes. 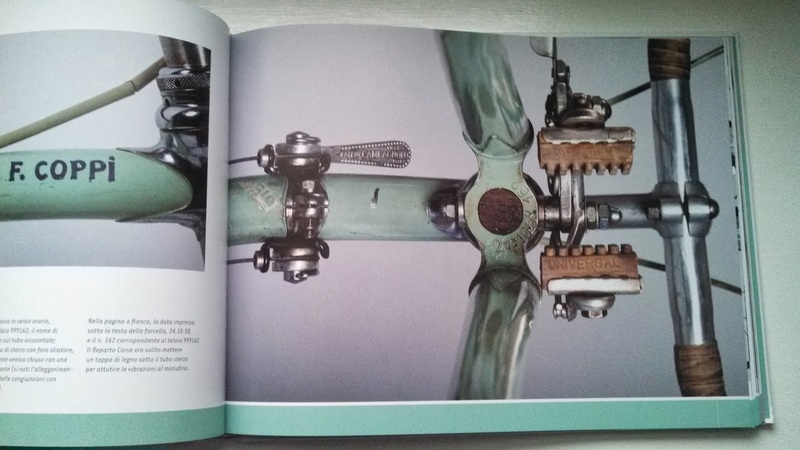 It is from this point of view that this book begins, from the impassioned research and description of the Bianchi bikes used by the Campionissimo over the course of his career, from 1945 to 1958. 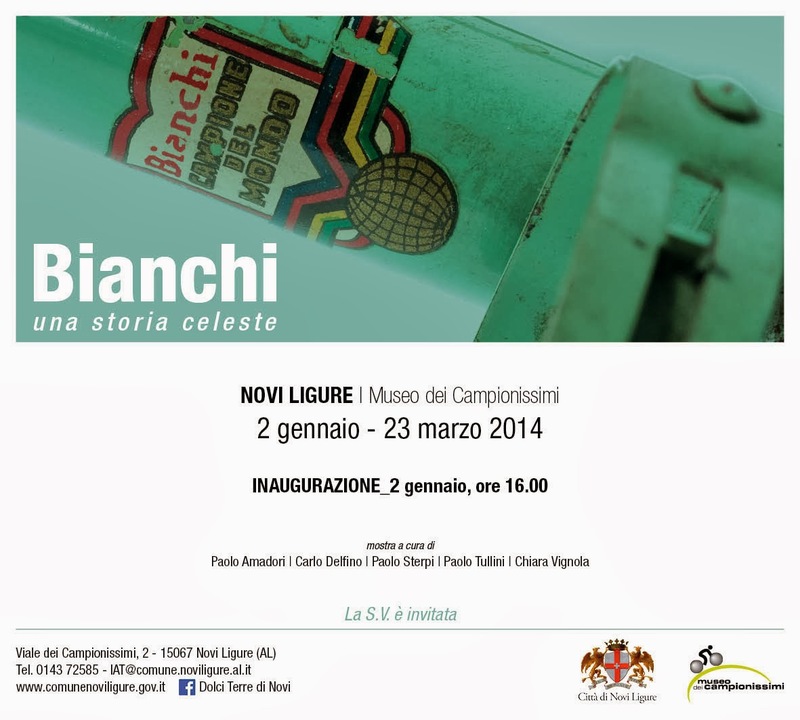 This has all been possible thanks to the an extraordinary find: the historical production records of the “reparto Corse” of Bianchi. 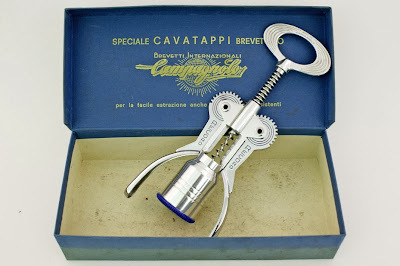 A true treasure has come to life from a forgotten briefcase - that of Pinella De Grandi, perhaps the most famous mechanic of cycling history, nicknamed “Pinza d’Oro” [the Golden Wrench]- and recovered by Paolo Amadori, one of the two authors of the book. 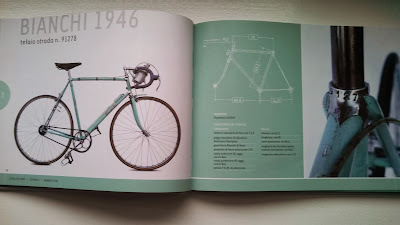 On top of the production records, which it had been thought were lost forever together with the frame numbers and sizes of the various frames built for all the Bianchi racers from the early 40's to the late 60's, the note books and the diaries of Pinella were also found, in which the mechanic to the champions noted, day by day, a variety of technical elements and notes about the performance of the riders in the races (in the Giro, in the Tour and in other competitions). 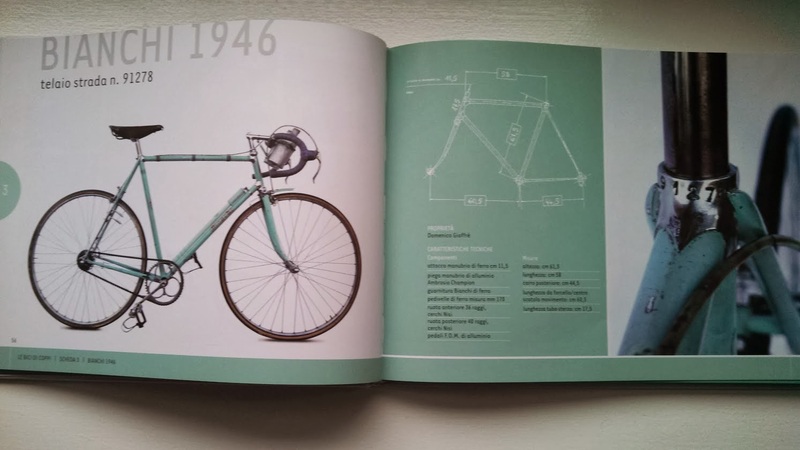 Thanks to these previously unpublished documents, the authors Amadori and Tullini have cataloged in detail 14 original bikes out of the 70 known to have been built for Coppi during his career with Bianchi (from 1945 to 1958), and have supplied an accurate technical description for each one of them, accompanied by rich photographic documentation, thereby telling in a new way and accompanied by numerous never before seen photos of the cycling exploits that saw these bikes accompany the Campionissimo. 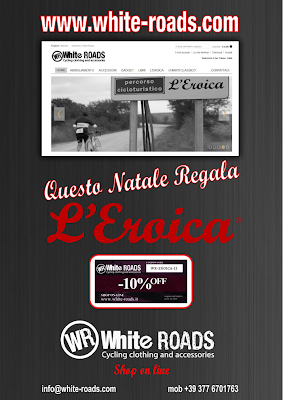 L'Eroica Announces "WHITE ROADS Cycling Clothing and Accessories"
"I have already dedicated 14 years of my life to the RCS Group, the last five of which I spent working tirelessly on strengthening and growing RCS Sport. As director of Giro d'Italia I sought to develop the prestige of this event as part of Italy's heritage and for cycling fans all over the world. Looking at the results, I would say that I have succeeded. "It was much to my frustration however that I could not participate in the presentation of that which I consider one of my most accomplished creations, the 2014 Giro d'Italia, and I apologize to all the friends I could not meet with," it continued. "Those who know me are well aware that my professional style is based on three key concepts: fairness, respect and dialogue. Those who know me also know that I hold the trust of fans and of people involved in the industry, at the center of my heart, and if today I can benefit from such trust it is because I have always worked with greatest transparency and honesty, as well as with total dedication and loyalty to the RCS Group. "For the ties linking me to Giro fans and to the people involved in the industry, I want to strongly reassure everyone of my non-involvement in the matters that have been reported in the mass media over the last few days. Today the life of a company is permanently marked in time and I am certain that all the facts will soon be completely clarified. "I only dream about the day I can return to my team, and get back to working towards the 2014 Giro d'Italia, with even greater enthusiasm than that which has driven me over these years." "I'm here because I need to get rid of the mud that has been thrown at me. I've not been able to speak because I was an employee of RCS. Today I need to say what I feel, to shout that I'm totally extraneous to what has happened. "I'm not under investigation but I can't see a single reason why I should be. I've never taken one Euro more than my salary. That'll be the most difficult thing to convince people. I was in the headlines, on the BBC and in the Washington Post. I hope I'll have the same headlines when I'm cleared. I want to prove my dignity to be 100% restored." "I was suspended and to be honest initially I wasn't worried. Everything seemed perfect when I came back from my holidays in September and we were ready to start working on the new season of events. After I was suspended, as the days passed I was hoping that things would be clarified. That didn’t happen until I was accused and then fired, with RCS saying "that I could have and should have stopped certain irregularities happening. I asked RCS to explain how I should and could have done that and asked for the reasons for me being fired. They replied that my request was an excuse and shouldn't have been made." "People think I've fooled myself about being cleared but I'd hoped to go back to work right to the end. To find myself out of RCS Sport is devastating and feel I've been stabbed in the back three times." "I've spent a long time thinking about my tomorrow. I'm 42. I've run a marathon in the past and now I've got to run another and start from scratch." You can see an interview with Acquarone, in Italian, here from yesterday (after 15 second ad). Area Zero Pro Team, the new, all-Italian continental squad coached by team managers Andrea Tonti and Ivan De Paolis has officially begun its adventure. Starting Monday, December 2nd, the entire team was hard at work at a retreat that will last until today at the Cà Virginia Country House in Borgo Massano, near Urbino, in the Marche region. The team's roster for the 2014 season is made up of 11 all-Italian riders: Giovanni Carboni, Fabio Chinello, Paolo Ciavatta, Silvio Giorni, Gianluca Leonardi, Gianluca Mengardo, Andrea Pasqualon, Charly Petelin, Simone Petilli, Marco Tecchio and Stefano Tonin. Andrea Tonti rode as a pro on important teams from 1999 to 2010 and was part of the national team lineup. In addition to his role as team manager he will also be following the guys during their races from the team car next to Massimo Codol, himself a pro rider from 1998 to 2012, here on his first experience as a Sports Director. "It's going to be three days of intense work," explains Ivan De Paolis. “The riders will be busy scheduling the season with the sports directors and athletic trainer Paolo Santello. There will also be team building activities to get the group on the same page, with our mental trainer Cristina Carraro (already a mental trainer for Petrarca Rugby Padova) who will then follow the guys throughout the entire season, and communications professor Fabiano Petricone who will illustrate the importance of knowing how to communicate effectively and portray an individual and team image in high level sports." This is a young, dynamic and motivated group that strives to stand out for its transparency and fairness; none of the people on the team or technical staff has ever been involved or associated with doping cases. 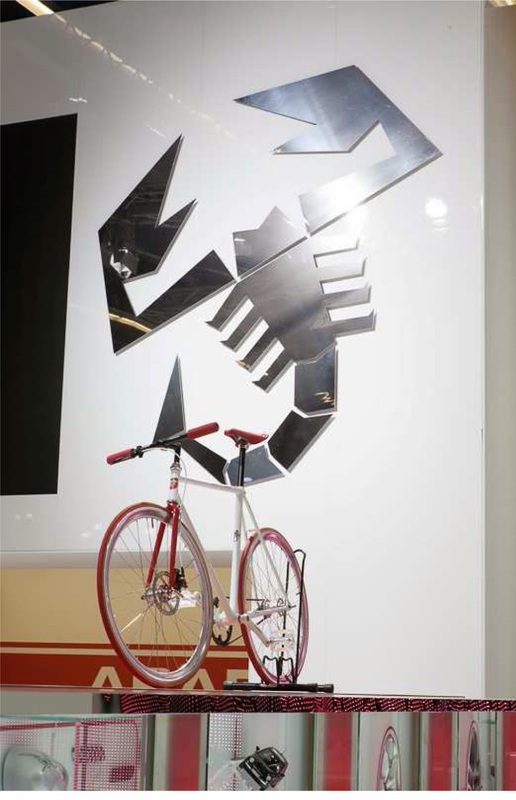 Bottecchia will be the brand of the bikes ridden by the team. 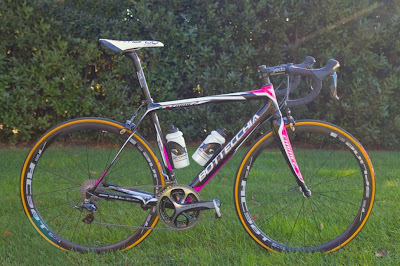 The riders will be using the Emme 2 model, the top of the range from Bottecchia's racing division. The frame is made in carbon and is produced entirely by hand in Italy. 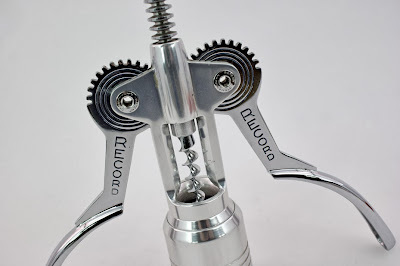 The bikes will be equipped with Shimano Dura-Ace components. Michele Acquarone, Managing Director at RCS Sports (owner of the Giro d'Italia, MSR, Il Lombardia, +) and director of the Giro d'Italia, has reportedly now been fired. He had been suspended in October as a precautionary, "non-disciplinary", measure while an investigation of a shortfall of 13 million euro was taking place. 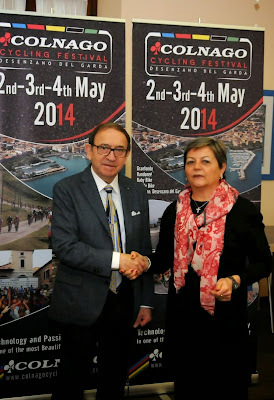 Mauro Vegni will assume the role of Giro d'Italia race director. Acquarone will be holding a press conference tomorrow at noon in Milano.
" I have dedicated fourteen years of my life to the RCS Group, the last five of which I spent working tirelessly on strengthening and growing RCS Sport. As director of Giro d’Italia, I sought to develop the prestige of this event as part of Italy’s heritage and for cycling fans all over the world. Looking at the results, I would say that I have succeeded. 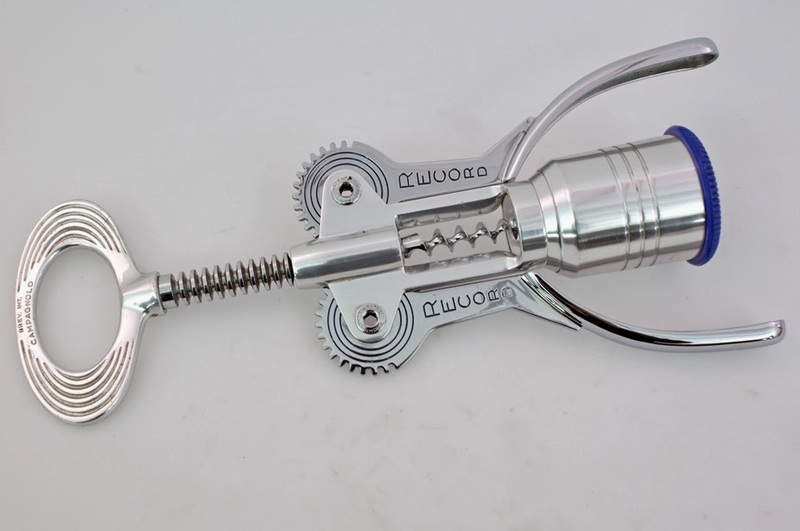 It was much to my frustration however that I could not participate in the presentation of that which I consider one of my most accomplished creations, the 2014 Giro d’Italia, and I apologize to all the friends I could not meet with. Those who know me, are well aware that my professional style is based on three key concepts: fairness, respect and dialogue. Those who know me, also know that I hold the trust of fans and of people involved in the industry, at the center of my heart, and if today I can benefit from such trust, it is because I have always worked with greatest transparency and honesty, as well as with total dedication and loyalty to the RCS Group. For the ties linking me to Giro fans and to the people involved in the industry, I want to strongly reassure everyone of my non-involvement in the matters that have been reported in the mass media over the last few days. Today the life of a company is permanently marked in time, and I am certain that all the facts will soon be completely clarified. I only dream about the day I can return to my team, and get back to working towards the 2014 Giro d’Italia, with even greater enthusiasm than that which has driven me over these years. Thank you for your support, and see you soon. "Saddles worth about 1 million euro have been stolen from Selle San Marco warehouses in Rossano Veneto (VI) during the night between Friday November 29th and Saturday 30th. This is the market value of the 6.000 saddles stored in more than 300 boxes ready to be shipped, that the thieves robbed introducing themselves within the factory after having forced the gate of the shipment storehouse, which is located on the back. High-end saddles as the top 2014 model Aspide Superleggera, all the Carbon FX models with Carbon rails and the Racing models. Besides the theft, it remains to evaluate now the unexplained damage caused by acts of vandalism to products left in stock. Further investigation are still ongoing. A terrible blow for our company, worldwide famous for the production of hand-made saddles for bicycles. 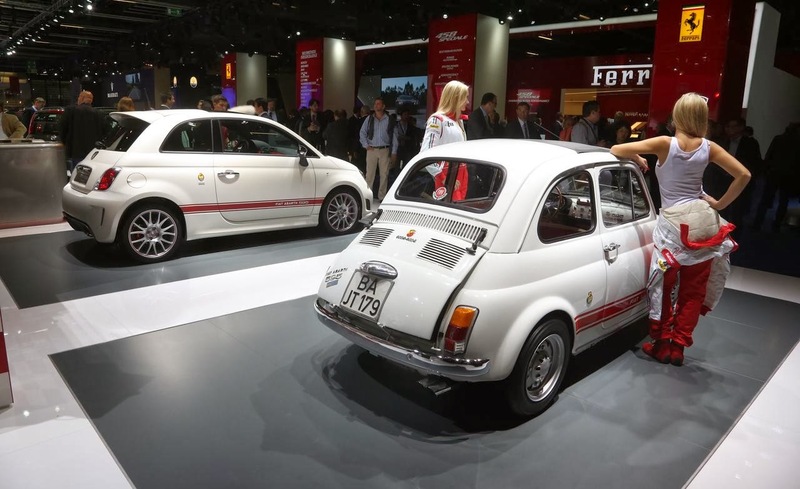 The unfortunate incident happened, in fact, at an important moment of the process of delivery of the new 2014 models, which are proving to be very successful in the market. 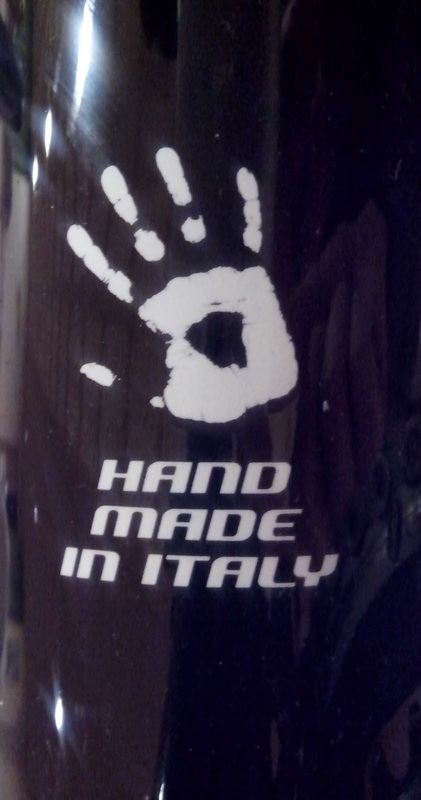 Investigators believe that the stolen goods can now be outside of the Italian national territory, but they are unlikely to be sold because the saddles have a warranty hologram and ID numbers of each product under the shell. At this time the company is checking the details of the codes involved. Selle San Marco apologizes in advance with their customers for the disruption that they will suffer in the upcoming days because of this. Unfortunately, it is in fact necessary a reorganization and a repurchase of components to process the orders and to realize them again and this will cause inevitable delays. The staff of Selle San Marco will try to answer as soon as possible to the countless e-mails that we are receiving in these days. The company also asked to point out to info@sellesanmarco.it the products that in the market may have too low prices and any suspicious situations. Everything will remain anonymous. The Girardi family, owner of the company, wants to thank the police for the timely intervention and all suppliers, friends and supporters, for the many signs of nearness that it has already received." Colnago Cycling Festival, a weekend of cycling in a fantastic place, Desenzano del Garda on Lago di Garda, from 2 to 4 May, 2014. Three granfondo routes plus the first Lake Garda Circuit Randonneur (200KM or 100 Km; ACP-Audax Club Parisien-regulations apply). Also the "Garda Legends" event! 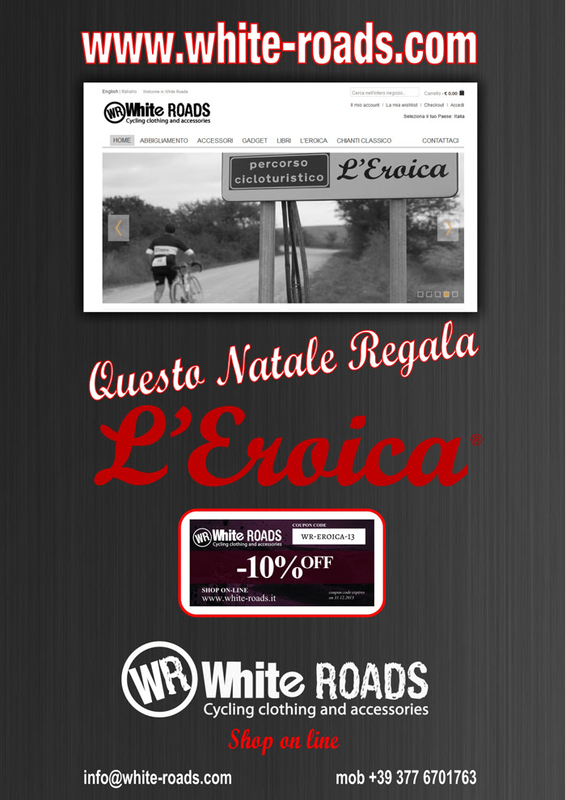 Only for cyclists with vintage “eroica” bikes will be admitted.